II can't remember the new color right now. My brain has gone to mush. 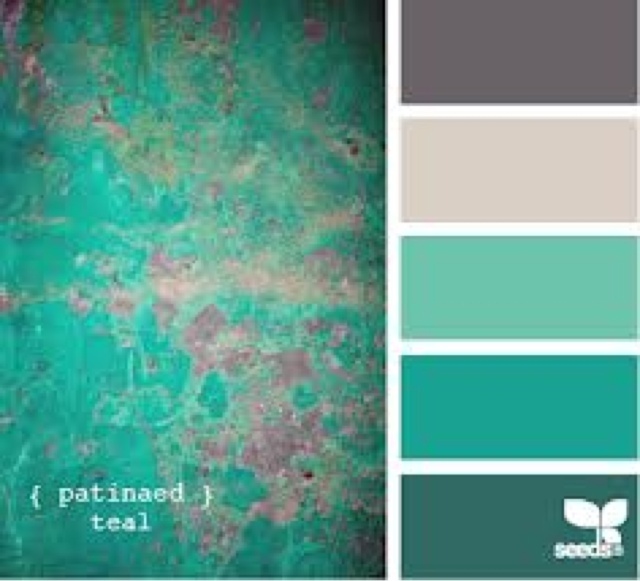 I am pretty sure we haven't done teal this year though. We left Florida just before 4 this morning thinking Mom would be home from the hospital by the time we reached Georgia. All did not go according to plan and it was a very difficult and terrifying day. They will keep her longer to try to stabilize her condition and hope that radiation will help with some of her new symptoms. 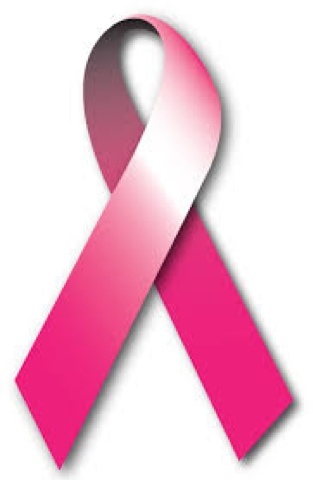 I am thankful for all the prayers and wishes as well as for being here with her during a difficult time. I hope that tomorrow will bring better news. I was happy to have some knitting in my purse today and finished a bright orange dish cloth while waiting. I think I have some nice yellow for tomorrow. I will have a new pattern to try if it is a quiet day. If all goes according to plan, I will be in a care headed to Georgia when this post goes live. 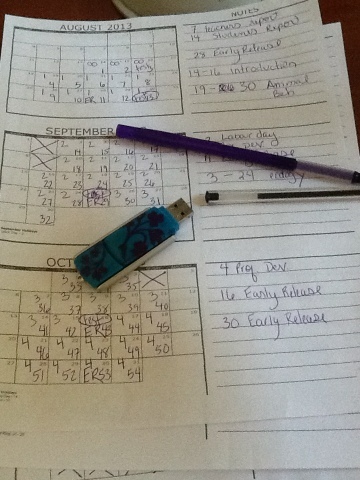 I have scheduled it ahead and am hoping that everything works as it should. Yellow isn't one of those HUGE colors that never seem to end, so I am hoping that everyone made a good sized dent and came up with some nice blocks during the month. Use misterlinky below to brag about your progress this month. 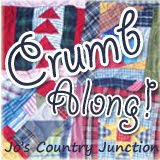 Be sure to check in and see all the other scraphappy goodness going on in blogland. I've been at training this week and have not had time or energy for quilting. Mom is back in the hospital again and I've been doing a lot of talking to people on the phone. We will be headed up this weekend so that I can help out in person for a while. I couldn't go a week without any quilt related something though. So today we were using an i-pad microscope to do epidermal peels of leaves in order to study the size and density of stomata. Cool right?! All you do is paint clear fingernail polish on a leaf and then use a bit of transparent tape to pull it up. So we did monocots and dicots, top and bottom surface, they were all nice. Then I got this peel from a fern leaf which is a seedless vascular plant and not an angiosperm at all. 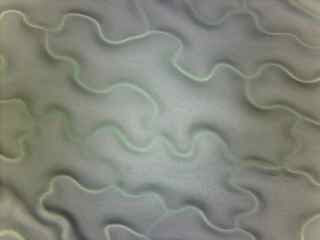 How much does that look like a free motion quilting pattern to you? Wait, here it is on high power. Tell me that doesn't just scream meander to you? So we each presented out findings to the class and I let them know that I would be posting my images on my quilt blog. Now that I need to figure out how to overlay a grid on the image and calibrate it to get a density per square unit of surface area measurement. Technology and science are both so cool. I am having much fun at the workshop, learning lots of cool things to do with my students, and best of all, I get to take the toys back to my classroom to use and to play with! 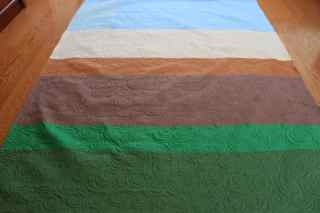 Hopefully quilt related posts will continue someday soon. 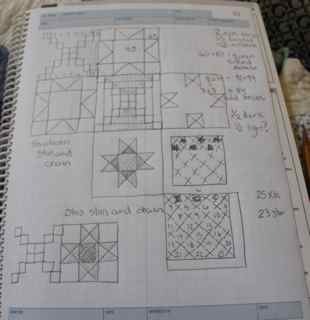 I've been busy this week with training but I did find some time in the evening to plan out Aunt Brenda's quilt. I have a program called quilt Pro for the mac, which I am still trying to get used to. 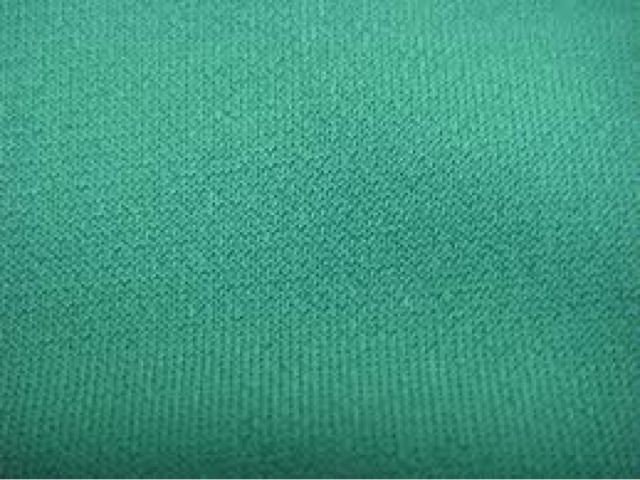 The darker background fabric has been shipped, I got an e-mail yesterday saying it was in Ohio. All the light blocks are done, along with the four patches. I even have the light strips ready to go but can't put the blocks together without the dark strips. Soon though. I finished 12 star blocks for Aunt Brenda's quilt! All the parts are cut out for the rest, but I am waiting for a darker background fabric to arrive. I have a vision. I hope it turns out half as well as the plan in my mind. Today is the only day this week that I don't have to work so I am going to make the most of it. Anna needs a drop off and pick up for camp of course, and there are some assorted errands to be taken care of. 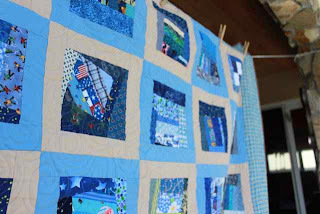 First though, there is a quilt of the frame that could be finished with just a few minutes of focus. I think it will be number 5 for June. I worked up a couple of practice blocks last night. The first star was too small. At that point I decided to stop practicing with my new batik fabric. The sawtooth star will finish at 12 inches, I thought it needed a little something, so looked up the measurements to replace the center portion with a square in a square block. Then I worked out an alternate block based on 2.5 inch squares with half light and half dark background. TaDa! I new quilt is being born. I don't have any darker background fabric, but the rest of it is cut out and ready to be sewn together again. The boys are off to Dungeons and Dragons this afternoon so the girls will have a nice lunch out with a trip to Joann's. Anna needs a costume for her play on Friday. She is going to be Veruca Salt from Willy Wonka Junior. We picked up a dress at Goodwill yesterday which we are going to alter, so we will get supplies for that at the same time. Getting bored of before and afters yet? One tiny project each day is keeping me moving. 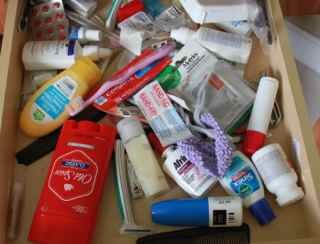 So the big question for today, how much stuff do we really need on a daily basis? Not that much as it turns out. Look at the fabric goodness that came in the mail! I have a very dear aunt who has asked me to make her a quilt. 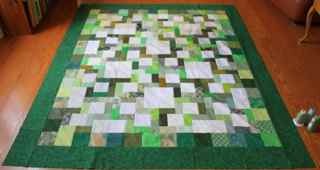 I also have another aunt who loves to hand quilt and has offered to quilt it for her after I have made it. They were shopping at a quilt shop with Mom and sent me a picture of a lovely Lonestar Quilt all made out of batiks. I've never worked much with batiks, but it sounded like a good chance to try something new. 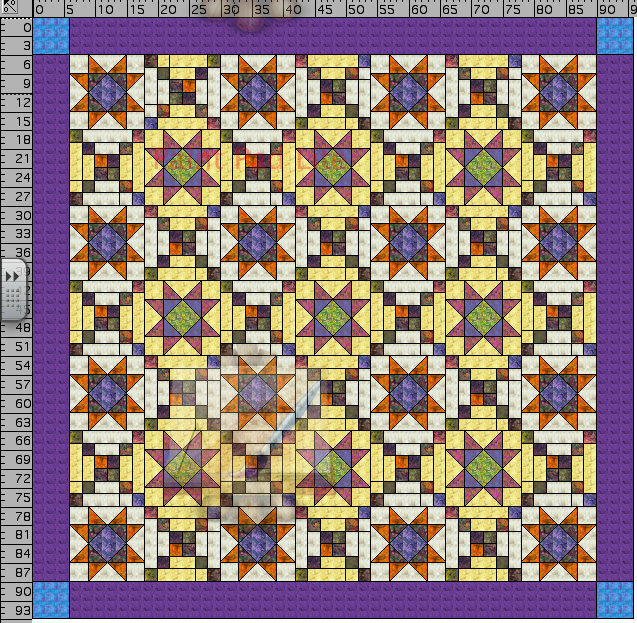 I'm not sure I can accomplish the Lonestar idea quickly enough to get this thing done in a reasonable time, but I saw a quilt that got my creative juices flowing here. Maybe because of the beautiful quilting? 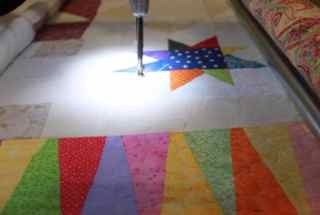 Wanting to keep things somewhat simple for hand quilting, I remembered the Mariposa quilt I had made several years ago with a sawtooth star block. Then I found this half light, half dark version of a chain block with some samplers stars. Then I started to make some sketches. In case you were wondering, this is how UFOs are born. 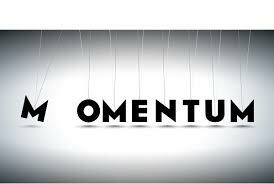 A new idea comes along and everything else that was in the works gets pushed aside. So now I'm off to make a test block or two while inspiration is flowing. ScrapHappy Saturday - Still Enjoying the Sunshine? Yesterday was the summer solstice for some of us. I hope you enjoyed the longest daylight of the year. I sure did. We are all off to a work picnic today during most of the sunshine hours, but I am hoping to get some quality sewing done before and after. Just two more yellow Saturdays remain, so make the most of the sunshine before it dwindles! Once a quilt is loaded on the frame it is pretty easy to pop into the quilting room and finish off a quick row between other activities. I got one done before morning carpool and then finished off the last few when we got home. Then it was a quick trip to the library to pick up a book for summer reading. Now we are home with snacks for a movie and ready to spend some time relaxing. I think I'll sew some binding while we watch Ice Age 4. 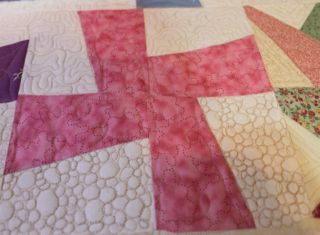 Here is a closeup of the quilting. A square meander works just like a normal meander, but instead of being curvy, all of the lines are straight. 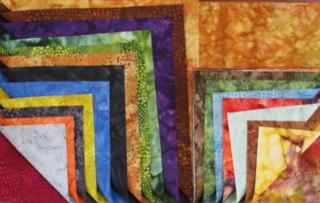 The quilting lines are all horizontal or vertical, and all the angles are 90 degrees. I have definitely decided that the key to getting organized is taking small bites. 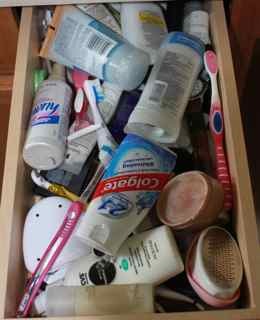 This is the drawer where Kurt keeps his bathroom things. Ah, so much nicer now. I peeked at e-mail after dinner and saw that Amy had finished two quilts today! 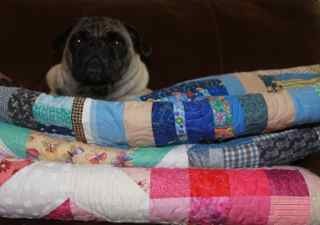 Two quilts?! 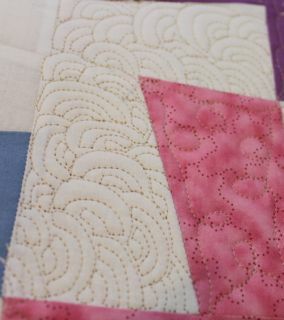 We have a little contest going on to see who can quilt the most tops during June. We aren't sure what the prize is, but I just don't like to lose. 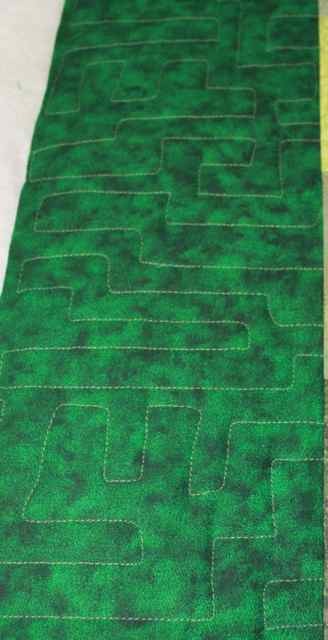 So as soon as we all got back from a nice evening walk around the block, I got the quilting started on Crossroads. It is going to get a square version of a meander which ends up looking a lot like a maze when it is done. So now, I'm off to quilt. I can't let Amy win! 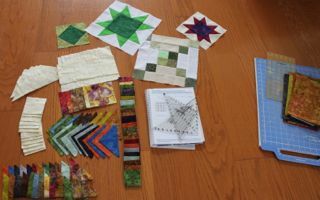 Tomorrow is the summer solstice, I think I should celebrate with a little quilting marathon. Festive, right? Hurray for home days. Anna and Sydney were both off to camp this morning, but Ryan and I got to have a home day! He was busy working on a robot he has been designing. 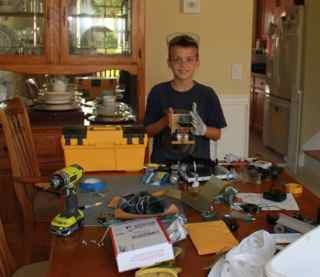 He seems to have outgrown the lego mindstorm kit and is building using sheet metal and motors from power tools. I'm not sure he will be able to make a working battle bot, but he sure is having fun. After supervising a little time with the drill press and making a quick trip to home depot, I was ready to tackle another organization area of irritation. 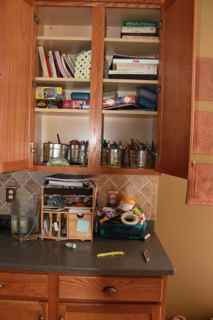 This is a spot that the kids have taken over where they dump all the things they don't want to put away. Right now it is full of extra school and craft supplies. I think the easiest way to prevent dumping is to start with a nice empty area. If it doesn't fit in the drawer it will have to go somewhere else. Seems reasonable, right? As for the drawer, that is a project for another day. Maybe one I can get the kids to do? Well, a girl can dream, can't she? Most of the day has been spent lesson planning. I have gotten out of the quilting mode all of the sudden. Still, considering that all the secondary teachers in our district are going to have to teach an extra class next year, any work I can get done now will make me life less hectic in the future. Again, I am full of dreams today. No quilting for me. I have been working this week. I was signed up to help out with some curriculum planning at school for next years home rooms. Though I only worked half of each day, it got me (temporarily) back into school mode. So I've been working on planning lessons for next year. Sadly though, there has been no motivation for quilting. 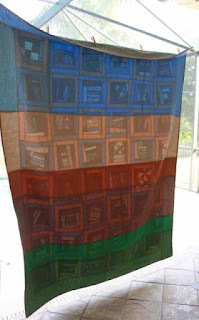 There is another quilt loaded on the frame and one more ready to go, getting those both done this month sounds like a reasonable goal. First though, I have morning carpool for camp today. Anna has a two week theater camp and Sydney has a single week with Mr. Science. After that it is off to the grocery store and maybe home again to quilt a bit before pick ups start at 3. Lazy summer days are never as lazy as it would seem. I have been loving my new Nike+ app. It has a nice reassuring voice that tells me I did a good job for running three times this week or that I have just logged my fastest mile ever. I was nervous about taking my phone out without a shock resistant case, but I had one in my shopping cart at Amazon and vowed to just be careful with it until then. Somebody should have told the dog to be careful. During our morning walk, she took off after a rabbit so quickly that she broke the leash! 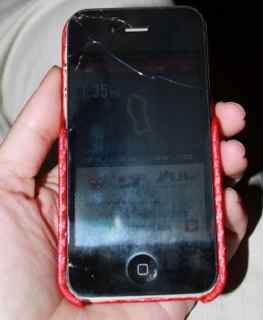 In doing so she knocked my phone out of my hand and sent it skidding across the concrete. So sad:-(. Lucky for me, we have had this phone for long enough that we are eligible for a new one and I can get the next version up for only $50. Bad dog! Sand and Sea is done! I just took the last stitch in the binding and hung it up for a quick photo shoot. 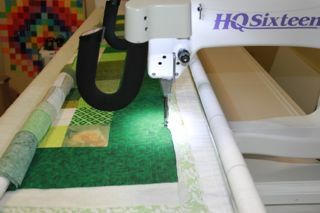 Here is another shot of the quilting. Waves and swirls freehand. And of course, the back. I think I'll make a pillowcase to store this one in and then move on to Mom's quilt. First though, to check on the pot roast. It sure smells good, hope it tastes good too. It has been a good quilting week. The reward for a good quilting week is apparently a stack of quilts waiting to have their bindings sewn down. What's a girl to do? I think I'll find a good movie and settle in for some nice quiet sewing time. It has been ages since I have done a before and after. Mostly because I forget to the take a picture before I start. I had just started tearing everything out of this cabinet in the laundry room when I remembered to go and grab the camera. 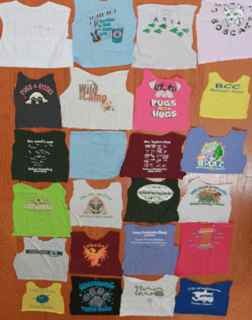 Most of what is in here are collections of t-shirts for future t-shirt quilts. 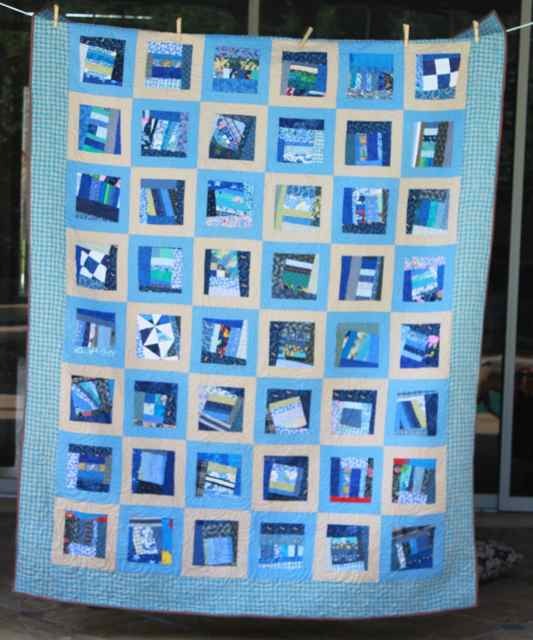 As Anna and Ryan have both finished elementary school now, it is the perfect time to tackle making quilts for them both out of all of their primary school memories. Anna helped with the cutting and just a few hours later we had separated the interesting parts and sorted them into piles by people. 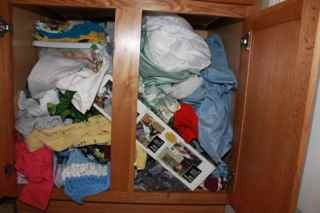 A huge back of sleeves and scraps have gone out to the trash and there is empty space in the cabinet! Each person now has a jumbo sized ziploc bag with nicely trimmed shirts waiting for their turn in line. 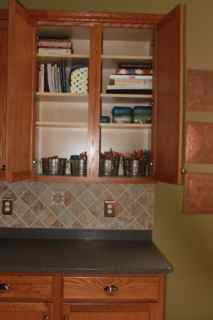 The only other thing in the cabinet that warranted keeping was a stack of home decor fabric. 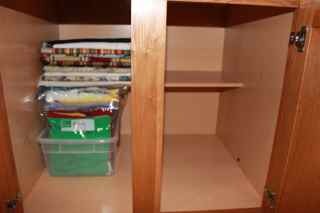 I keep it segregated from my quilting fabric, and it is now folded and organized. Since Anna helped with the manual labor, her quilt is first in line. This is the layout she has planned so far. There was a neighborhood party at the park this afternoon, but when it was over we started ironing on interfacing and trimming the blocks to size. We had a nice assembly line going with Anna ironing and me cutting. I think it is about half done so far, but we are all taking a break for dinner. 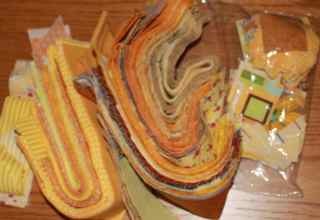 I hope you are still having fun with your yellow scraps. Today I plan to work on some yellow postage stamp blocks with 1.5 inch squares. I've fallen a bit behind on these blocks, so maybe I'll catch up on a few other colors while I have the drawer out. One nice thing about having company is that it forced me to take time to clean and organize everything in the sewing room. I'm working on making it chaotic again, but for now it is nice to be able to find things. Summer break has made it hard to remember the days of the week. I was already out and taking the dog around the block before I remembered that today was Saturday. Use the linky below to share your own scraphappy creations and be sure to visit the other RSC13 participants. Happy scrap busting! I mentioned earlier that Anna had called "dibs" on the orphan block quilt. She has decided that she wants it to be her quilt and that it will go to sleepaway camp with her later this summer. Therefore, she wanted to quilt it. I had her do a quick sketch on a bit of scratch paper and then she jumped in and started quilting! She started with a basic meander before long was trying out a loop-de loop. 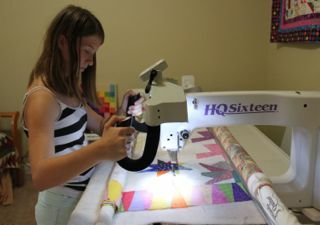 So for everyone who wanted to know if using a quilting machine is hard, apparently even a child can do it. Then started picking out a new pattern for each block. I pulled out the pajama quilter workbook and showed her a few patterns. She traced each one with her finger and then jumped right in with no fear at all! We did have to take a quick break for dinner. Anna was talking about how happy she was going to be to snuggle up with her new quilt as soon as it was done. Then Sydney got got a confused look on her face and reminded us that the quilt was supposed to be for children without parents, not for Anna. I guess we should have been a little more specific when we called it an orphan quilt. It is done now and I've just finished sewing on some binding from the leftover binding drawer. 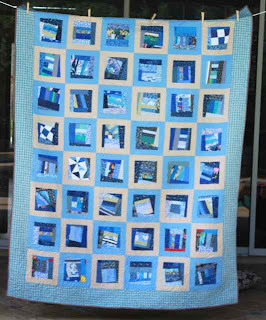 From start to finish, every bit of this quilt was leftover from something else. How fun it that? So first up today I decided to piece a batting for the practice quilt. Then of course the kids wanted to swim. 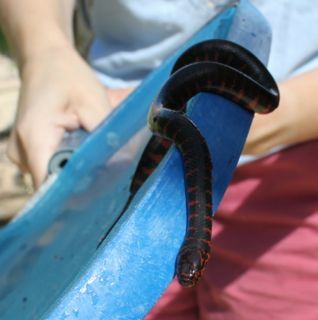 We fished this snake out of the pool. 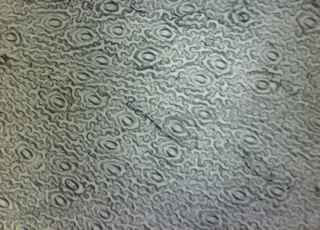 I've seen this paisley design as a back ground on a lot of quilts. I think it will take some practice. This was a small fan variation. The designs are so small that the stitches look huge. Eventually it occurred to me that I should turn down the stitch length. The border was getting a little branching vine. The top is called brain coral and the bottom is pebbling. 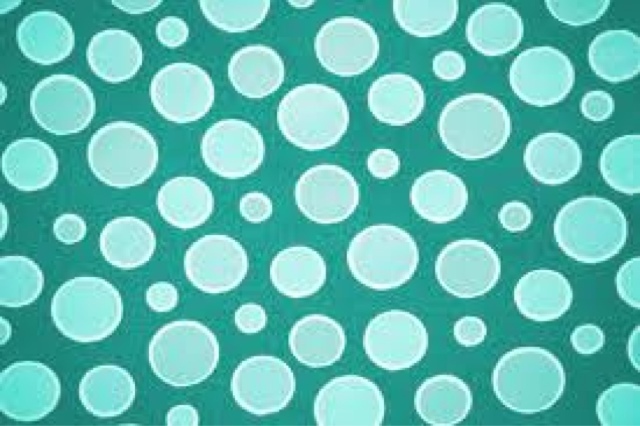 I have been looking patterns up form Leah Day's web site. I think the quilt is about 1/3 done, so there is still plenty of room for more practice. Kurt did morning drop off today. Isn't he sweet? So I spent the morning piecing the borders for Jamestown Landing. It all needs a good ironing. Maybe I'll see if there is a good movie recorded and spend some quality time with the iron. The afternoon was taken up with closing ceremonies for Math Camp. Guess who the grand champion was for the Mathcounts competition? 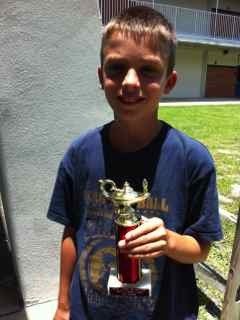 Here is Ryan with his first place trophy! He was pretty excited. I know it is hard to tell from the picture, but this is Ryan's super ecstatic face. I was almost laughing out loud when he answered a question about the area of a triangle and then explained to his competitor how he got the right answer, his little hands were making all of these angles in the air as be walked her through the computations. So I'm pretty sure he'll join the math team next year, and hopefully robotics as well. I think he is looking forward to middle school at this point. I've been using my Handiquilter and frame to finish my quilts for a few years now and never taken the time to think much about thread. 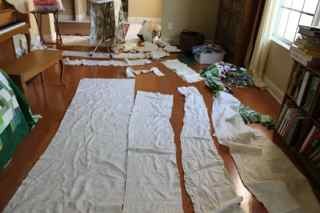 It doesn't seem to be picky and sews along without complaint most of the time. 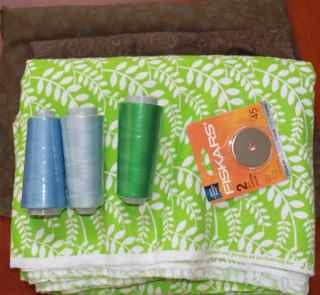 Never knowing what color of quilt will come together next, I like to be able to go out and pick up a spool when I am ready to finish up a top. I'm a big fan of Connecting Threads as a rule and have enjoyed using their Essential PRO cones. However, the only cones that they have at my local Joann's are serger thread, and I have been using those as well with no problems. 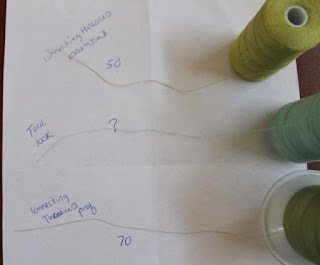 I was happy to read Jo's post earlier this week about using Maxilock serger thread and was relieved to know I wasn't some oddball quilting rebel for using cheap thread. It doesn't list a size on the cone, but by comparison I'd have to say it is about 60 wt and 100% polyester. So what thread do you use for quilting? Is it worth the extra price for the name brands or is it all about getting it done? I thought I would never get this one off the frame! Tuesday is our morning out, but I was sure I would be able to finish it up the minute we got home after lunch. I am doing morning drop of this week for math camp, so the afternoon was looking good. We had just gotten home again, my rear had just made contact with the couch to check on e-mail when the phone rang with a friend wanting Sydney to play. Back in the car we went for a quick drop off as this is the friend who moved to a neighborhood nearby. Finally home again I was ready to jump back in when my cell phone rang. Ryan threw up at camp :-( Oh no! Back to the car again with fresh clothes. Sure enough, when I finally made it home for good, the quilt was done within minutes. I used a light blue thread and free motion swirls for this one. I'm thinking brown for the binding. Not that I have any brown of course, but tomorrow is another day. 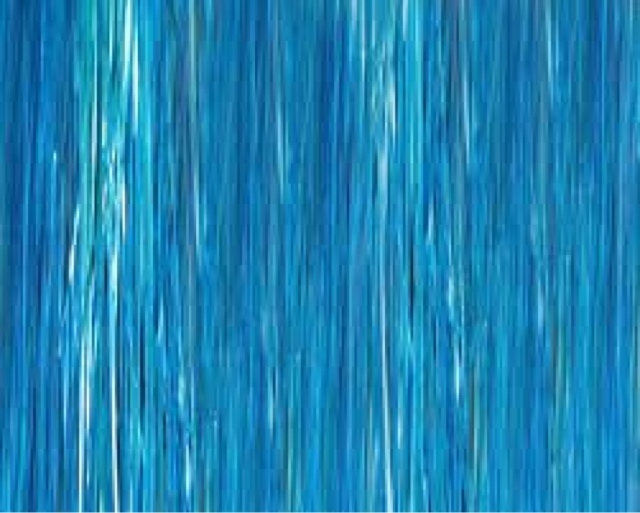 I'm going for an ocean effect on this one. I have three actively underway, each at a different stage, this one sits on the frame while the green quilt is getting borders cut to size and the pink quilt has just had its binding attached. I can't decide if it is fun jumping from project to project or just strange. 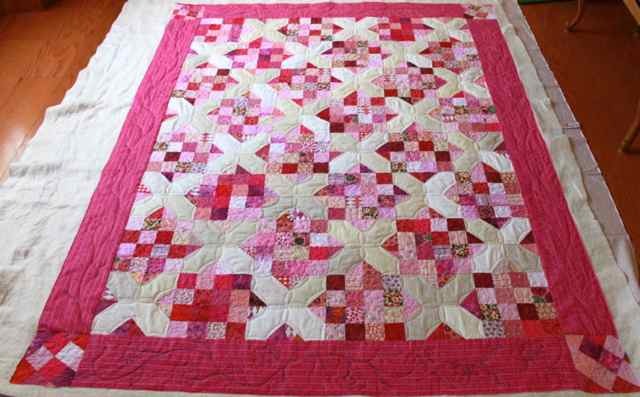 Just pulled the pink chemo quilt off of the frame. Pardon the purple Crayola marker in the border, I wanted a quick guide for some wavy flower vines. I like to wash quilts anyway, so the marker will come right out. I'm a little overwhelmed with the pinkness of this one and am tempted to bind it in something completely different. Maybe yellow or purple? Just one of those random thoughts that comes during the quilting process. While hopping out this morning to get some needed blue thread, I had to check out the clearance section which was half off at Joann's. I love to stock up on quilt backs at half off. The top green is a cozy flannel for the the back of the green crossroads quilt. The next one down is a nice brown that would make and excellent backing or border and the bottom of the stack is a nice nondescript olive. No definite plans for those, but at $2.00 and $1.50 a yard I will be happy to have them on hand. Pink Blocks are SO Close!